If last week's cool temperatures made me want to break out all my soup recipes, this week's winter-like weather made me want a direct IV of soup flowing through my veins. It also made me realize that I need to stock up on hot chocolate. Winter, I'm not ready for you yet! 1. One Pot Chili Mac and Cheese from Damn Delicious. Since last week's chili was less than stellar, I decided to try a new spin this week. When I make a big batch of chili, I like to turn some of the leftovers into chili mac (chili mixed with macaroni and topped with cheese), so I liked the idea of this one-pot chili mac, no leftovers needed. This was so good, so easy to make, and so perfect for a cold night! 2. BBQ Pork Burgers, adapted from How Sweet it is. I originally saw this recipe when Anne made it, and after I tried it myself it was deemed a keeper at my house. This time, I swapped the ground chicken for ground pork, just to try something different, and it was delicious! 3. Chicken Noodle Soup. To me there's nothing better than homemade chicken noodle soup with freshly made broth and homemade noodles. However, the reality is that I rarely have the time to make it. My favorite substitute for homemade chicken noodle soup is store-bought chicken stock or broth, shredded rotisserie chicken, and frozen Reames noodles. Of course it's not as good as homemade, but it's still warm and comforting on a cold night! Not pictured, but worth mentioning: I swear, I could never be a food blogger! We had a great dinner on Sunday night and I completely forgot to take pictures. We had Slow Cooker Chicken Tacos from Pass the Sushi with Mexican Rice Casserole from the Pioneer Woman. The chicken was so juicy and flavorful, and it stays nice and moist in the slow cooker since it cooks in enchilada sauce (I used homemade but you could use a can to make it even easier)! The rice dish is a favorite that I've made several times, I just tweak it a little by using salsa instead of diced tomatoes with green chiles. Are you cooking anything good this weekend? I love me some chili mac! And mexican food is always a win, I'll have to check out both of those recipes! I don't know what we're cooking yet this weekend, but I think something warm because it's going to be cold again! I know - I'm about to make a big pot of chili here this weekend. Warm me up! Good reminder on the BBQ burgers. This twist sounds tasty! And I'm definitely checking out this slow cooker chicken tacos too. They're good ones, you should check them out :) Stay warm this weekend!! It's definitely chili weather, whether I'm ready for it or not! Enjoy yours this weekend and stay warm! I'm definitely looking for some more slow cooker recipes. I love the idea of throwing it in and forgetting about it. 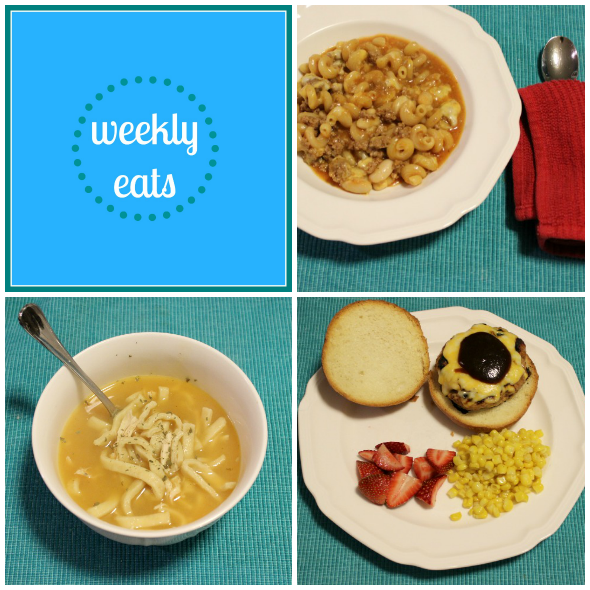 Glad you had some tasty meals this week! Yes, I agree--putting it in in the morning and then coming home to dinner that's already made is a treat! !